The sequel to one of the most action packed zombie shooters in recent memory has finally arrived after a long 12-month wait, but will L4D2 be able to improve upon an already solid co-op experience? The Zombie Apocalypse Part 2: Left 4 Dead 2 takes place at about the same time the original was taking place simply in a different location: the south! After a deadly virus turns most of the population into murderous zombies, a small group of survivors band together to fight the zombie apocalypse by killing one brain munching infected at a time. This time the southern portion of the United States is under attack by what seems like trillions of zombies, attacking everything from malls, swamps, circuses and generally entire cities. 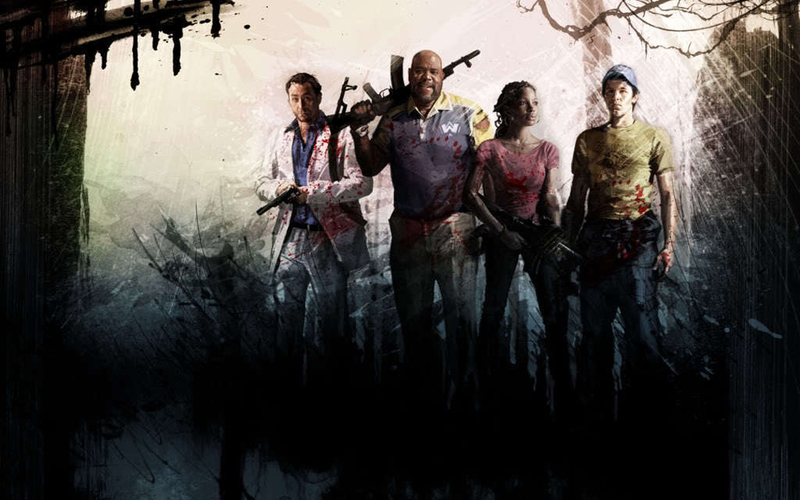 Despite being essentially the same story featured in the original Left 4 Dead, you will see four new faces in the sequel. Not all of the characters are really likeable, and none play much of a role in the narrative except for occasional one-liners, but it is nice that Valve added some new blood to play as. Coach - A former star defensive lineman in college, after suffering a career ending ankle injury Coach managed to salvage his degree and landed a job working as a defensive coordinator for the freshman team. Coach acts as a sort of leader to the others, trying to keep their attitudes positive despite an imminent death in a dire situation. Ellis - A country boy mechanic who loves to take risks and is always looking for something else to do. When the zombies attack his little hometown, he sees it as a fun challenge and is constantly looking for things to do to impress his new friends. Ellis is the outspoken one of the group and thinks the zombie apocalypse is nothing but fun. Nick - A lifelong drifter who moves from city to city hustling and looking for a quick buck decided to stop by the city to take some easy cash from riverboat gamblers. When all his customers turn into zombies, he is forced to trust and work together with the rest of the team. Rochelle - Normally a low-level producer at a big name news corporation, when the virus begins to spread she gets her break and is sent on scene to an evacuation center in the city. Her big story quickly turned into a fight for her life against a numberless amount of infected. Rochelle is the most quiet of the group and doesn't say much, but she is still looking for the big story to send her to super stardom. As I mentioned, the characters aren't exactly the most complex people in the world but they do help add some interest into the storyline and the one-liners can be funny at times. Variety Is The Spice Of Life: L4D2 also has a ton of gaming modes at your disposal, and each one has a little something different to offer. You can choose from the Campaign (online campaign with friends), Versus (humans against the infected), Survival (try to last as long as you can as a team going against endless waves of infected), Scavenge (online a four-team of human search for fuel while a four-team of infected try to stop the humans), local co-op Campaign (split-screen campaign with a buddy on the same console), and Realism Mode (a tougher version of the campaign mode). You will have plenty to choose from in L4D2 whether you plan on playing online or running through the campaign with a friend. I've Fallen And I Can't Get Up: On the actual gameplay side of L4D2, there isn't much new to be seen. You move through a variety of levels from malls, swamps, parking lots, apartment buildings and more fighting past waves upon waves of zombies on your way to the safe zone (a resting area to re-stock on ammo, health packs, etc). What really makes L4D2 as great as it is though is the co-op gameplay. Playing through the campaign with a friend makes more exciting, and there is nothing better then seeing your buddy get pinned down by a Hunter only to be saved by you! There is a slight problem with the friendly fire though, as online your teammates tend to shoot you a little too often. Whether on purpose or not (it can get rather frantic), it still happens and in a teamwork oriented game like L4D2 getting shot by your teammates isn't helpful. In addition, your computer-controlled teammates have a bad habit of walking into your line of fire. Too often you will be spraying a horde of zombies only to see Coach walk right in front of you while you're spraying zombies like Earl Scheib.
. Nonetheless, if you aren't playing with three other CPU teammates or very stupid Xbox Live players, the co-op is what makes L4D2. Without it, this title would be little. A Sick Director: What helps make Left 4 Dead 2 so intense is the return of the AI Director (2.0), which controls how many zombies are sent after you. The AI Director will watch how you play, and if you are going very well don't expect to keep your impressive run going. The AI Director will relentlessly send massive waves of zombies after you. Conversely, if you are struggling you will be able to noticeably see the pace slow down a bit to help you out until you get back into the groove. The AI Director really helps pump up the intensity when playing through the campaign and is a nice way to introduce new players to the game but at the same time give experienced players a challenge. Zombies Are Ugly Alright: The visuals in L4D2 are one of the weakest aspects of the game and it is difficult to be impressed by the eye candy in the game. Left 4 Dead 2 is run off the same graphics engine that fueled the original and it is easy to see that the engine is starting to show its age. The visuals do not look to have been touched at all since a year ago when Left 4 Dead came out, and with what impressive looking games are out there on the market you would think Valve would have at least touched up the graphics a bit. Its not a huge issue as most of the time you won't get a chance to stare at the environments, but with how much graphics have advanced since even last year the visuals look even more so disappointing. Rent vs. Buy: Left 4 Dead 2 is a phenomenal co-op title and has some great, extremely intense action throughout the entire campaign. The gameplay, while mostly unchanged does feel just a bit more fun then the original. In fact, everything about L4D2 (except for the graphics) are improved, if only slightly, from the original. If you are a co-op lover and have somebody to play the campaign with locally, you cannot go wrong with a rent and possibly a buy if you personally believe it to have some lasting value. We personally found the game to be very enjoyable with a partner, but not worth the full retail price. If you could find the game heavily discounted though (perhaps at one of the $39.99 Black Friday sales), then we can't argue with picking it up.